Robert Rahmanian is the Principal and Co-Founder of REAL New York, a company that provides authenticity, transparency and a client-centered approach to business. He offers a fresh perspective into the strategies that help landlords optimize on their real estate, and provides the tools his agents need in finding their clients the perfect space. Possessing an extensive background in real estate, Robert built REAL New York with a hands-on approach to leadership. His family’s investments in New York properties during the 1980s and 1990s influenced his understanding of how to optimize profit and tenant-utility of a property. Through honing and expanding his knowledge of real estate, Robert has been able to serve property owners, developers and tenants in all boroughs of New York City. As a broker and a landlord, Robert uniquely recognizes needs on all sides of the table and uses this to best serve clients. Robert possesses a broad range of building principles, from architecture to renovation oversights, which allow him to reposition and value-add to a growing portfolio of personal and client investments. A New York native, Robert has an intricate understanding of how neighborhoods change and grow. Adaptability and a keen sense of the industry have allowed him to service the needs of agents and clients alike at REAL New York. 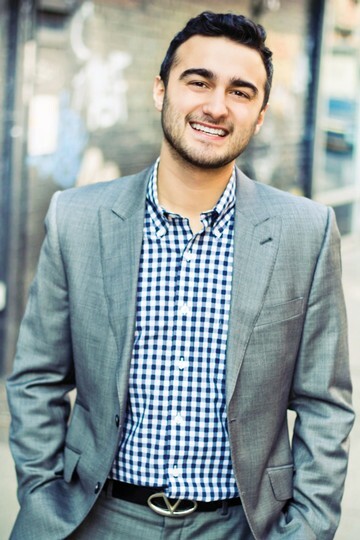 Robert graduated with a Bachelor's Degree in Real Estate Investment and Business Law from CUNY’s Baruch College, and his ambitions were fostered by living, working and studying in New York City. After establishing REAL New York in 2013, Robert and co-founder Louis Adler devised an authentic, customer-centric strategy that allowed them to focus on residential consulting and leasing in the Lower East Side. With extensive industry knowledge surrounding development and investments, Robert excels at identifying market conditions, assessing property values and negotiating the best deals on behalf of landlords and clients. His influence now positions him as an unparalleled leader in ensuring economic viability, securing rent rolls and limiting vacancies. Robert’s expertise has attributed to the expansion of REAL New York throughout neighborhoods in Manhattan and the outer boroughs. Among his accomplishments, Robert takes pride in his industry expertise, understanding of numbers, and strong relationships. By fostering the same real estate principles he learned in his youth, Rob is able to provide REAL New York’s employees and agents with the mentorship to optimize fast-paced growth and reach. In his spare time, Robert Rahmanian enjoys spending time with his family, growing community bonds and supporting Jewish charities. Among his philanthropic pursuits, he is involved in the Maccabee Foundation and Iranian American Jewish Federation (IAJF). Moving to NYC from California a couple of years ago, I luckily avoided the dreaded broker process of getting a place opting to move into a roommate situation. Fast forward now realizing I wanted my own place, I worked with a few different brokers on getting the right spot and some have been painful to say the least. However Real New York is the real deal when it comes to getting things done in a professional manner. I ended up getting an apartment in LES where Rob personally helped guide through the whole process. What stood out was his ability to communicate, be transparent about the process and of course getting my place at no fee. I immediately stopped working with other brokers once having discussions with him about my hunt and what I was looking for and he helped guide me to getting the lease accomplished without any hassle. If I end up looking for another place down the road I''ll def be contacting Real NY! April 2014 by Kambiz H.
Robert went all in to find me an apartment that I liked. At some point I felt like he is finding an apartment for himself. He genuinely cared and listened to all my needs and never gave up. He walked with me for hours from one unit to another in order to find me a place that I liked. His partner louis jumped in when we needed more support to close the deal and at the end the teamwork got me a place that I happily call home now. They are for real and they are after helping people while making money. Very good people to do honest business with. March 2014 by Danielle C.
My roommate and I worked with Rob, after coming across one of his exclusive listings on a NYC apartment site. Rob was absolutely fantastic! Our "wishlist" of what to have within a NYC apartment was no small feat, potentially a washer/dryer, big living room, true two bedroom- downtown mind you. Rob not only showed us several places that included our wishlist, but I could have seen myself living in several of the options. Ultimately, we wound up in what I would say is potentially one of the largest true 2 bedroom apartments I've seen in NYC for below our price point! I would highly recommend Rob. He's a no B.S. broker who has wonderful building connections. He works incredibly hard for you and finds you a great place. My roommate and I couldn't be happier we found him! !